Creamy dairy product made from the fermentation of milk with specific bacteria. Often contains live and active cultures which aid in the digestive process. Yogurt is cultured both to extend the shelf life of the milk and for the added health benefits that it is supposed to provide. Smooth and creamy, it ranges in texture from sour cream to creme fraiche. Typically pours like a liquid but certain types of yogurt are slightly more solid. Choosing: Always look for yogurt with live active cultures. 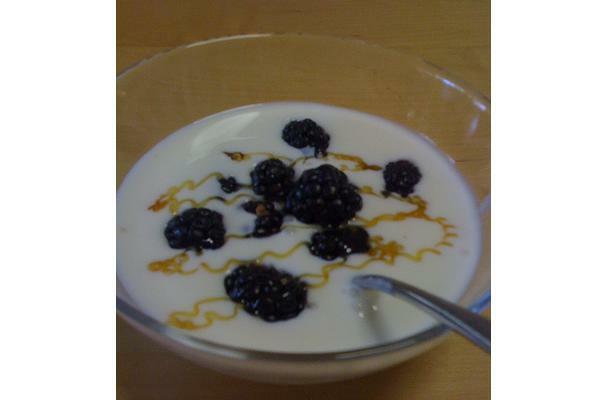 In the west, yogurt is typically served with fruit, granola, or honey. In the middle east and Asia, there is a long tradition of using yogurt in savory applications: as the base for sauces and as an enzymatic marinade to break down tough meat. It is also used as the base for drinks such as kefir, typically sweet and fruit flavored, and the Turkish Ayran, which is usually salted. Yogurt should be kept in the refrigerator. Follow "use by" date on packaging.